Who has not dreamed of overleaping all obstacles? who, tired of endlessly boxing with a recalcitrant reality has never felt like ending the bout once and for all, the sparring that leaves us reeling and groggy , and with one powerful leap find himself on the other side ? and with one exhausting back - breaking roads, On a path is light , On the Way of the mind . according to Hindu Mythology it is Hanuman Who can lead us onto this path .Because to fly on the path of the wind one must become the wind, and Hanuman is the Prince of the air . 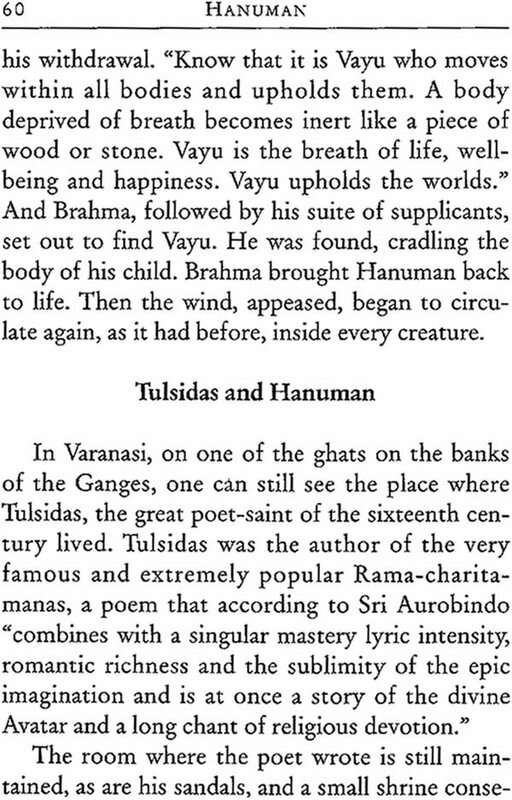 “Vayuuputara” or the son of vayu , god of the wind. And what is the wind if not that which outmanoeuvres all hindrances , bypasses obstacles, find the opening and plunges into it ; chooses to caress or strike , has no fixed from yet can take any form , always perfectly filling the space it occupies, always the exact measure of any adversary ? 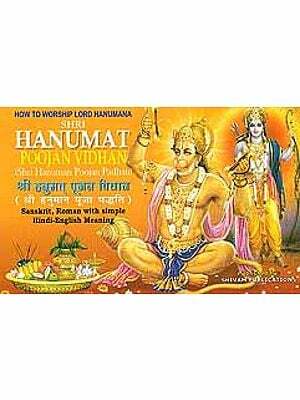 In the epic of the Ramayana , Hanuman , the Monkey – God , Son of Vyau , is the faithful messenger of king Rama. He represents the Ideal of the highest and most ardent devotion. Who has not dreamed of overlapping all obstacles? Who, tried of endlessly boxing with a recalcitrant reality has never felt like ending the bout once and for all , the sparring that leaves us reeling and groggy , and with one powerful leap find himself on the other side? 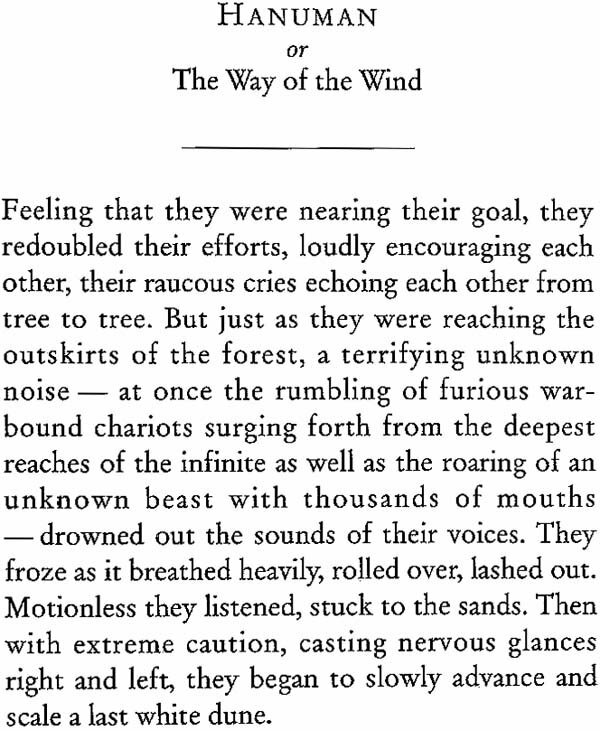 Far from the exhausting back breaking roads, on a path that is light , On the way of the wind. According to Hindu mythology it is Hanuman who can lead us onto this path. Because to fly on the path of the wind one must become the wind, and hanuman is the prince of the air, “Vayuputra” or the Son of Vayu , God of the Wind . and What is the Wind if not that which outmanoeuvres all hindrances bypasses obstacles, finds the opening and Plunges into it; chooses to caress or strike , has no fixed yet from can take any form , always perfectly filling the space it occupies, always the exact measure of any adversary. And is he not our most intimate companion , our very life-force, form our vey first cry to the last breath we draw? With us in the exaltation of a sudden joy that fills our being, in the sighs of our discouragement , in the steady breathing of the measured race , or the rising of anger’s waves , in our moments of suffocating depression and anguished doubt , in the warm relaxation of tranquillity, in everything we think or do. And Yet despite this constant proximity, despite the fact that our very life I s permeated by its substance, and our energy dependent on the way it circulates within us , we know little about its power. And it is where Hanuman, son f the world , comes in. The great sages of ancient India Had described and given a name to this essential principle of life. In the Vedas it was known as Vayu, god of the Wind in his outward form , but more profoundly the lord of dynamic energy , the master of Prana –a word that can be translated as the Breath of life, its most important manifestation in man being the force presiding over the distribution of air within the body , called respiration. Vayu is he Who moves, breathes, expands, grows without limits. 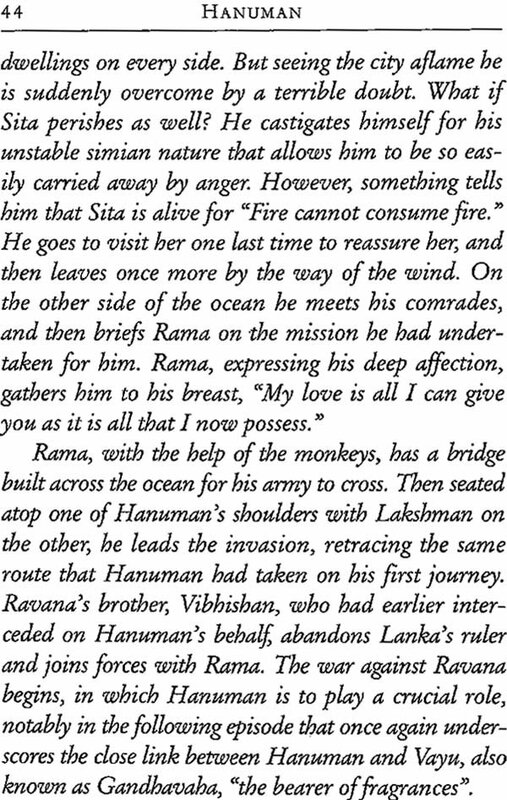 He is the immortal breath , the unbroken thread that links all our lives m gives life to each of our new embodiments, and leads us across the straits of life just as Rama seated on Hanuman’s Shoulders is carried across the ocean , Vayu ‘s domain is that of the intermediate sphere , the middle realm that links spirit with matter. In the epic of the Ramayana, which was composed much later than the vedic hymns , Hanuman , the monkey- God, son of Vayu , is the faithful messenger of King Rama . He represents the ideal of the highest and most ardent devotion, but underlying this, it is still possible to sense the more ancient symbolism. But why a Monkey? 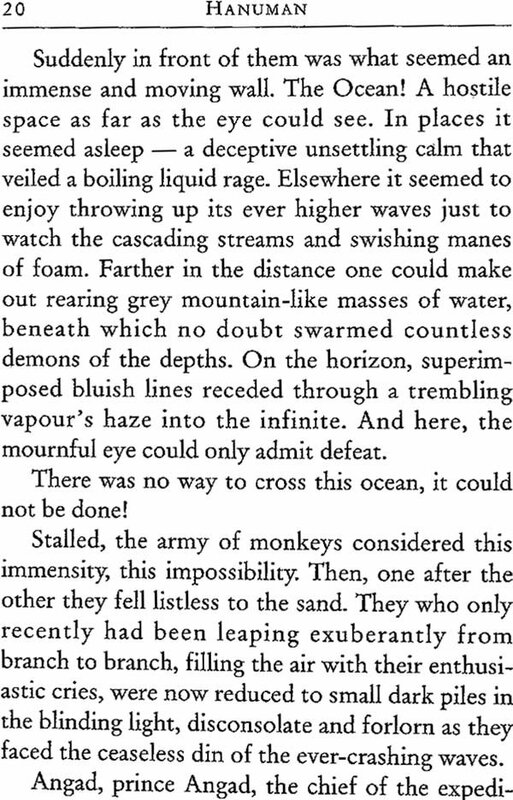 What is the link between Vayu, the Lord of the Wind , and the simian form that Hanuman takes On? There are many words that refer to the monkey is Sanskrit. The Monkey is the animal that inhabits the forest (vanara ), the One that jumps (Plavaga ) It I s also called Kapi (from the root kamp , to tremble ); hat which is always in a state of trepidation.th e texts also describe the monkey a chanchal , that is to say, agitated, unstable, with a tendency to suddenly shift moods from enthusiastic to discouraged, or form fearful to aggressive . In other words, it is a being in which the nervous pranic energy manifests itself in a primal uncontrolled Way.. a being whose physical receptacle has difficulty containing the vital energy without its difficulty containing the vital energy without its spilling over. In this vital energy without its spilling over . In this sense it is a striking symbol of a certain aspects of human nature. It may not be a coincidence that one can play with Sanskrit word coincidence that one play with the Sanskrit word vanara (forest dweller, monkey ) reading it as va-nara meaning “or a man”. Albeit a monkey, and thus associated with this force, Hanuman is also the price of the wind, and therefore a master of this energy . He knows how to use and tap it , how to direct and control it and make it grow in him. One should remember that hanuman is traditionally considered a brahmacharin, One who has taken the vow of celibacy , that is, in a deeper sense, one who has mastered his impulses. 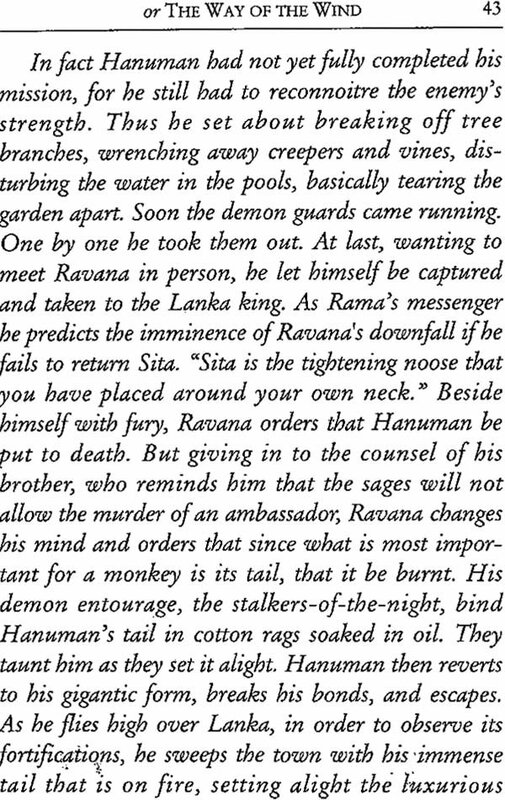 But to really know Hanuman one must look even deeper. In fact, in the evolution of Indian culture, from the ancient symbolic thought of the Vedas the ancient symbolic thought of the Vedas to the “imaginative religion” that is so characteristic of the later Hindu tales, many levels of meaning have become superimposed without in any way being exclusive . thus , Hanuman is not only the most glorious of the Kapi, he is not only the son of the Wind an d Master of the life- principle. He is also the perfect representative of that very same life. , not only mastered , but entirely placed at the disposal of the divine’s [power. Hanuman offers this inexhaustible spring of life to which he has access to Lord Rama , to do with as he will , whatever it be for action , or to be retained and held back , much as an arrow that the great archer lets fly or not . He allow lord Rama to tap this magnificent vital energy and perform deeds that are either grandiose and perform deeds that are either grandiose or subtle , depending on the moment’s need. Servant and ideal messenger, for whatever need Servant and ideal messenger , for connected with and inspired by Lord Rama , his highest hap piness lies in the perfect accomplishment of the mission with which he has been confided. His only aim and goal is that of Ramakarayam , “ the work f Rama “, and if one can speak of Hanuman’s personal joy , it is that of the ecstasy of a musical instruments supremely played by a master artiest. One thus sees that two major elements of Indian spiritual search are combined in Hanuman : Shakti , Power and devotion The extracts chosen here are an attempt to highlight these two complimentary sides of Hanuman. 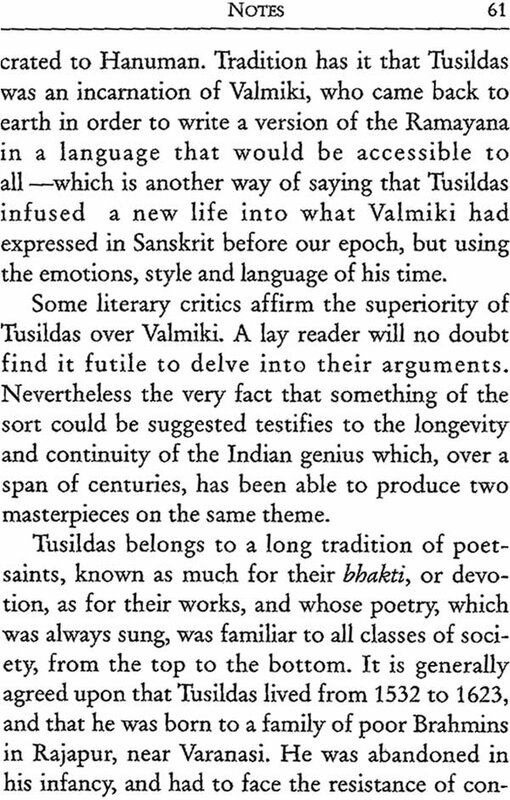 We have sometime borrowed from Valmiki , the creator of the original epic in Sanskrit , and sometimes from Tulsidas, a great sixteenth century poet who wrote a version of the Ramayana in the poplar language of the time.